Harun Nasution Auditorium, UIN News Online â€“ UIN Alumni Association (IKALUIN) Jakarta holds Halal Bi Halal and Alumni Dialogue, by raising the theme on â€œKreasi dan Kiprah Alumni dalam membangun negeriâ€, Saturday,Â (7/22) at Harun Nasution Auditotium, Campus I of UIN Jakarta. A number of cross-generations alumni who take part in various professions also present to enliven the activities. 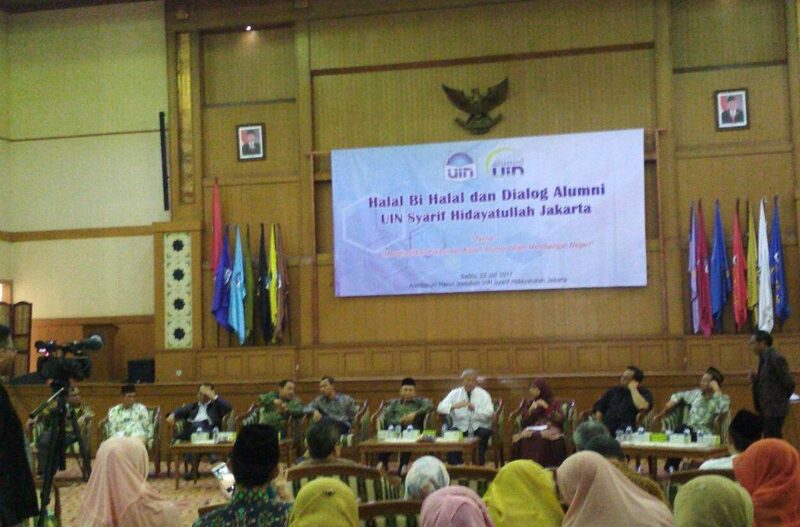 Present in the event, Dr Wahiduddin Adams SH MA (Constitutional Justice of the Constitutional Court of the Republic of Indonesia), Dr (HC) AM Fatwa (Senator of DPD RI and Founder of Putra Fatahillah Foundation), Dr TB Ace Hasan Syadzily MSi (Member of DPR RI), Encop Sofia MA (Member of DPRD Banten), Drs KH Ketut Imaduddin Djamal SH MM (Member of Bali Bina Insan Islamic Boarding School). Also present in the event, the head of IKALUIN Jakarta Ahmad Zacky Siradj, General secretary of IKALUIN Jakarta Prof Dr Syukron Kamil MA, Dr Euis Amalia MA (Head of BMT Syahid), Dr Fadilah Suralaga MSi (Vice Rector of Academic Affairs UIN Jakarta), Prof Dr Yusran Razak MA (Vice Rector of Student and alumni affairs UIN Jakarta), KH Budi Rahman Hakim MSW (Founder of Jagad Arsy Islamic Boarding School), Pramono Ubaid Tantowi MAÂ (Central KPU Commisioner), M Afifudin SAg Msi (Bawaslu), Ahmad Najib Burhani PhD (Researcher from LIPI), as well as another civitas academica of UIN Jakarta. Zacky Siradj in his remarks said that silaturahmi among the alumni must be maintain for the good sake of UIN Jakarta alma mater. He also hopes that UIN Jakarta alumni can give the color of excellence in developing the nations. â€œThe role of alumni must be felt by this beloved alma mater. 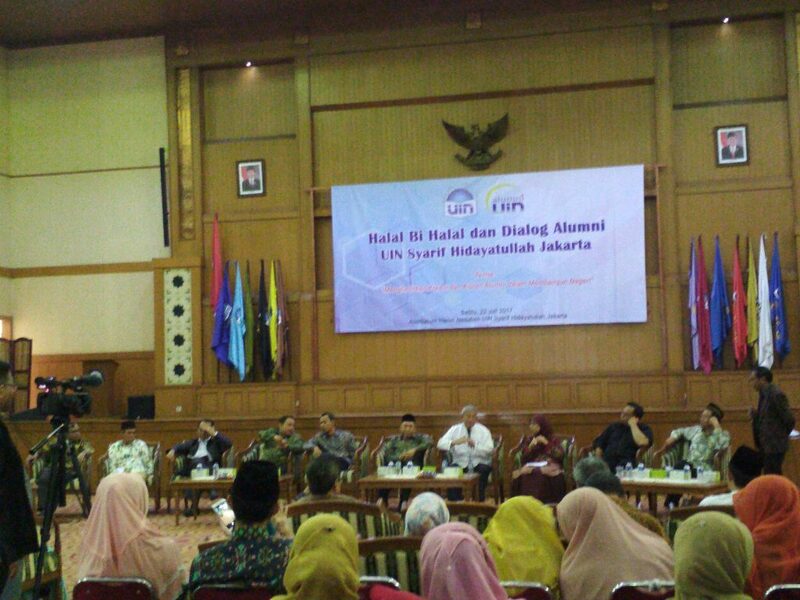 Mutual support between alumni and hope for UIN Jakarta in the future,â€ he said. In this occasion, Vice Rector for Student and Alumni affairs UIN Jakarta Prof Dr Yusran Razak Â MA Revealed that UIN Jakarta is heading for PTN BH and preparing its qualified alumni to be accepted in the global market. 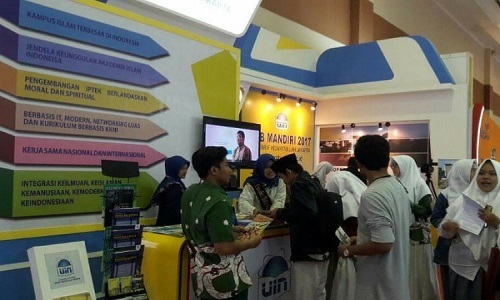 â€œTherefore, we are currently trying to improve and emphasize the integrity, morality and Islamic values in every student of UIN Jakarta,â€ said Yusran. In this open dialogue of Alumni, some alumni are given time to share their experiences for the advancement of the beloved alma mater according to their respective fields, in the field of Government and Bureaucracy, namely Dr. Wahiduddin Adams SH MA, AM Fatwa, Dr TB Ace Hasan Syadzily MSi, Encop Sofia MA, Pramono Ubaid Tantowi MA and M Afifudin SAg Msi. In the field of Daâ€™wah and education, namely Drs KH Ketut Imaduddin SH MM, Drs KH Mudrik Qari MA, and KH Budi Rahman Hakim MSW. While in field of academic and practitioners, namelyÂ Ahmad Najib Burhani, Dr Rumadi Ahmad, Andi Syafrani SH MCCL, Iman Niâ€™matullah SH, and Siti Hasanah Sag MM. According to AM Fatwa, lot of things had colored his journey after he graduate from UIN Jakarta. “Wherever we go after graduating from UIN, put it in our hearts that we must provide benefits for our beloved alma mater,” he said. While Wahiduddin expressed his struggle in applying for a job after he graduate and finally succeeded in becoming a Constitutional Justice. “It is very hard if we do not have integrity and ability. Today, there is no difference between alumni from IAIN or other public universities. Because we have the same ability “he said. 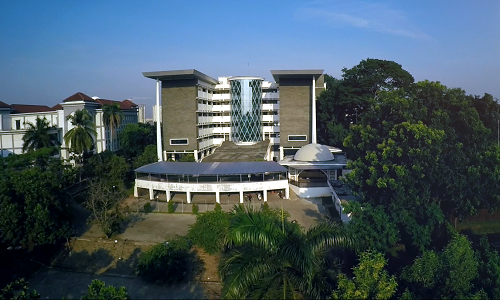 Furthermore, Vice Rector for Academic Affairs Dr Fadhillah Suralaga MSi revealed that the alumni of UIN have the same potential with other university graduates to develop or country, the Republic of Indonesia. â€œWe have a high degree of Integrity between Islam and Indonesian-ness in creating the intellectual ulema and ulama who also an intellectual,â€ she said.